This pose is often included with the Warrior series. 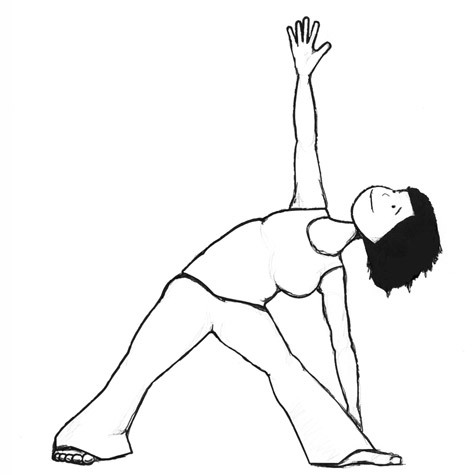 I often include it after Warrior II, but for the purposes of this pose guide, we’ll start it from Mountain Pose. Turn your left foot directly out to the side, and look down to align your left heel with the arch of your right foot. Shift your hips to the right exhale and extend your torso to the left so that your fingertips go out past your toes and lower your left arm down the outside of your left leg (to the floor or at your shin, or if you have a block, you can place the block to the outside of your left ankle and lower your hand down to the block). Turn your chest towards the ceiling and bring your right arm directly over the left shoulder. Inhale to come up and be sure to repeat this pose on the side.